Having a place to stay and use as a base was great. 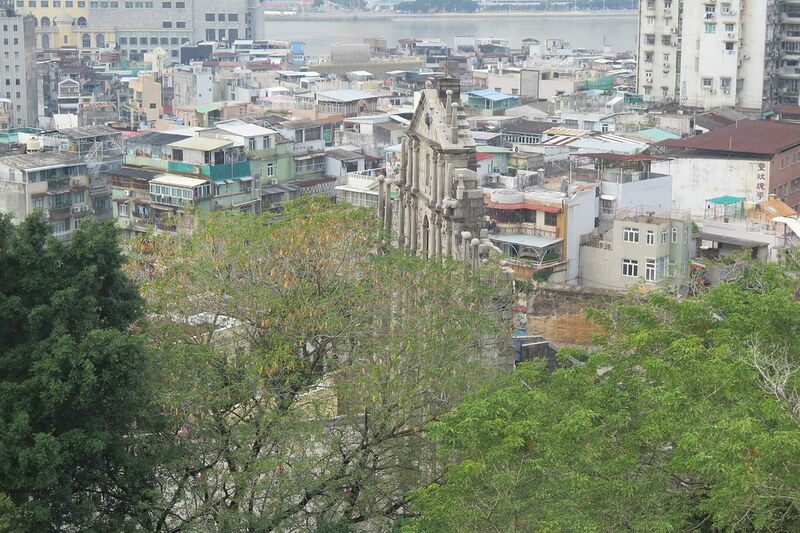 It gave us a chance to get essential stuff done, like renewing our China visa and getting a 30 day visa for Vietnam. 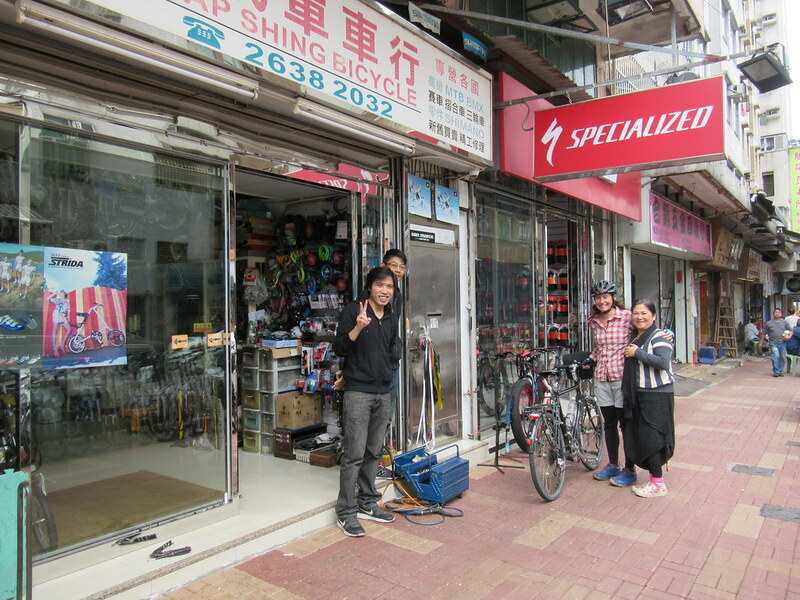 We gave our bikes a good clean and service, washed all our clothes, and just spent some time relaxing after quite a hectic few weeks riding through China. We didn’t spend all our time sitting around though. 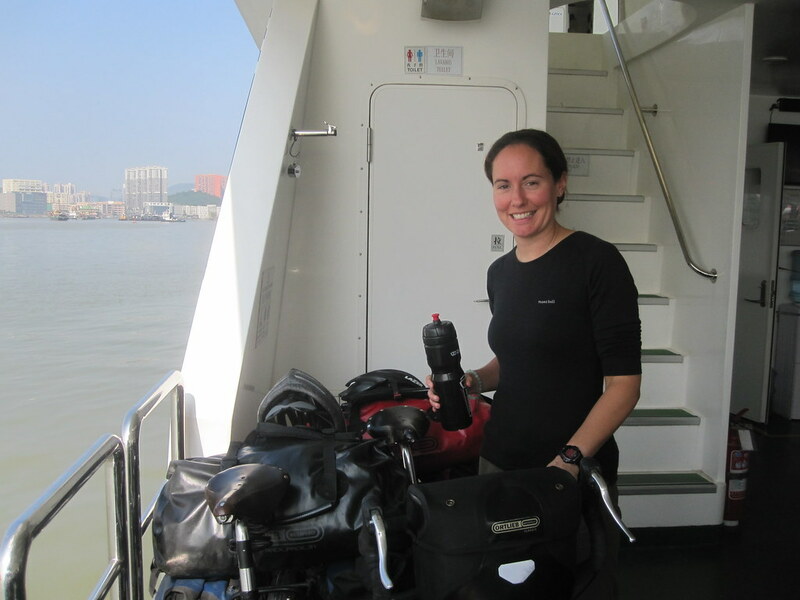 On Day 100 for this trip, we felt we ought to get out and go for a ride, so we went for a quick spin around the Hong Kong Wetland Park and alongside Deep Bay. 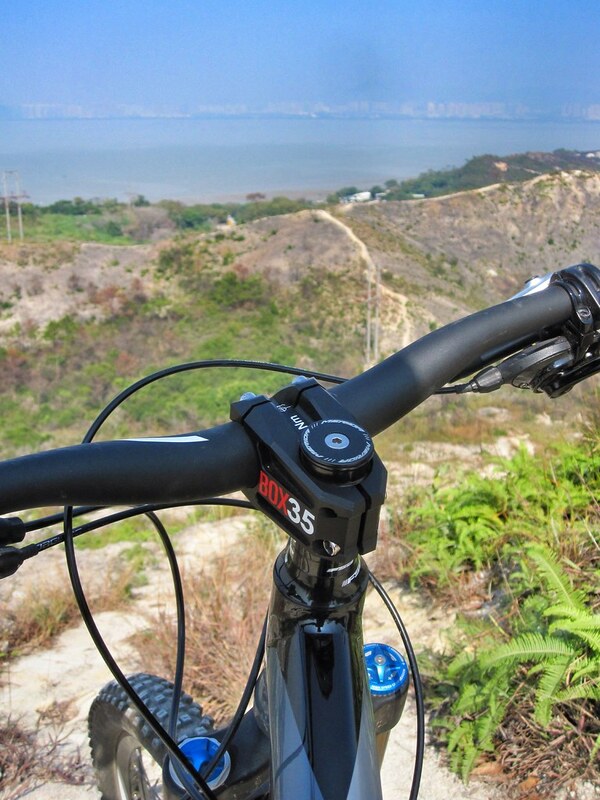 Sam also lent me a mountain bike and we went out a couple of times riding the local hill. 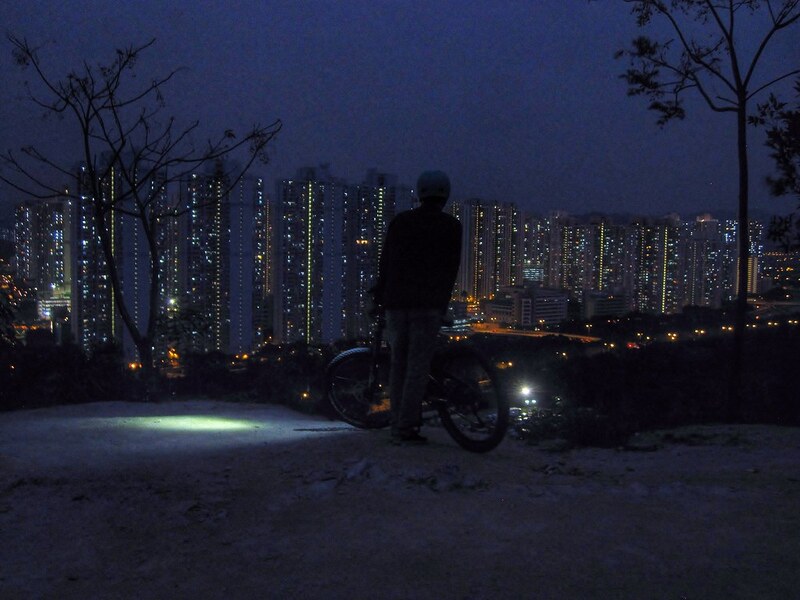 I’m pretty confident on my touring bike riding busy Chinese roads, paved or not, but a light, full suspension mountain bike on a steep hill was a different ball game altogether, especially when I went out with Sam riding the trail after dark! 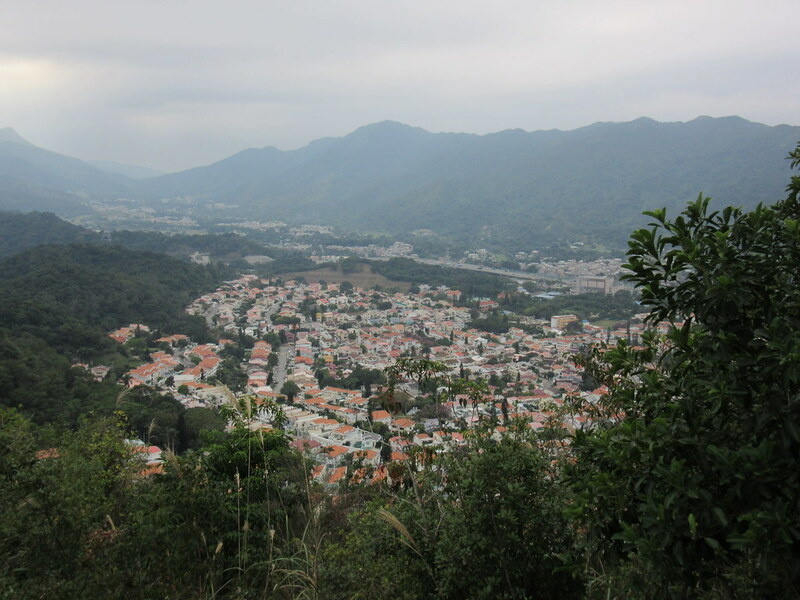 I also dragged Clare around some of my old haunts on a 65km loop through Shek Kong and Tai Po. It was a nice ride down memory lane for me, and I think Clare at least enjoyed some of it, despite a couple of steeper than expected roads. We also had a chance to meet up with a few other friends. 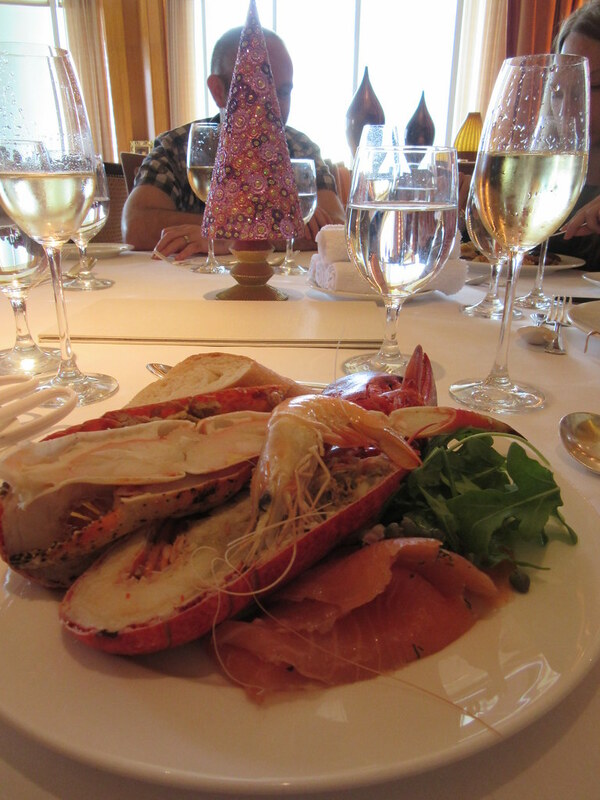 On our first weekend in town we were treated to a champagne brunch at the Conrad Hotel by the Sharps/Darling family. We celebrated Heather’s birthday, and also congratulated Sam on an amazing half-marathon time that he ran that morning. It was a very pleasant few hours of indulgence and catching up with family friends. 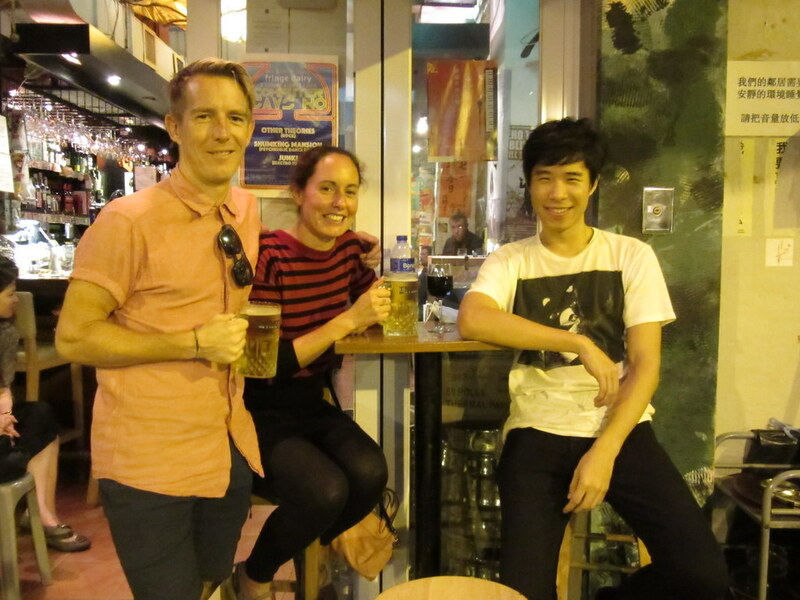 Clare was contacted by an old school friend, Tommy, when he saw our Facebook post saying we’d arrived in Hong Kong. 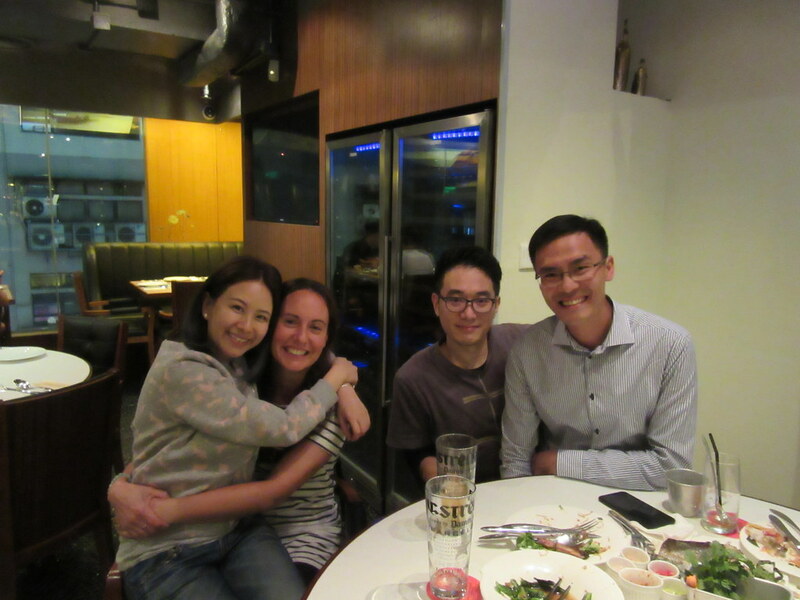 Tommy, along with a couple of other school mates, Yan Yan and Wai Kit, very kindly took us out for a great Thai meal in Tsim Sha Tsui one evening. We had hoped we could’ve gone hiking with them all a couple of days later, but we had to go and collect our China visas that day, unfortunately. 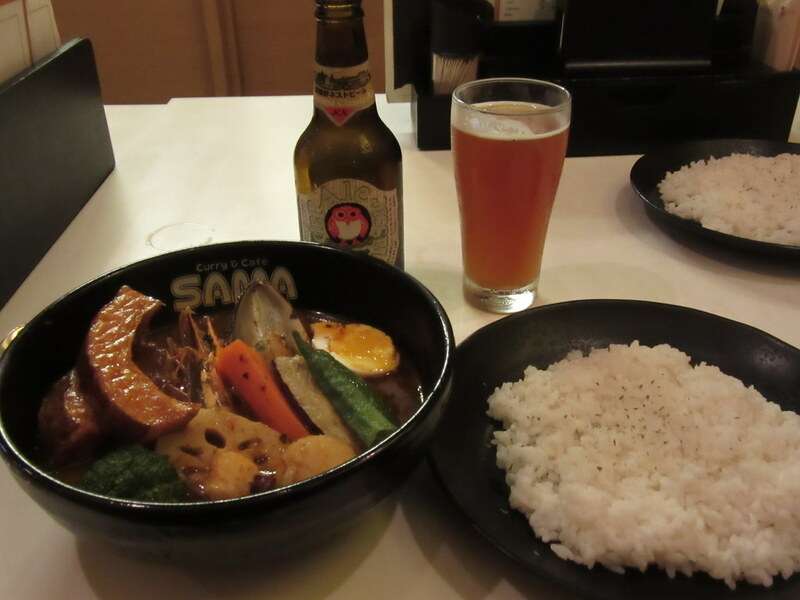 We also found a soup curry (our favourite Hokkaido food) restaurant in Hong Kong! We couldn’t resist another bowl of the good stuff, and what better company than an old friend from Hokkaido, Ian. Thanks for the dinner, and a great evening Ian. Please come and see us when we’re back in the UK! 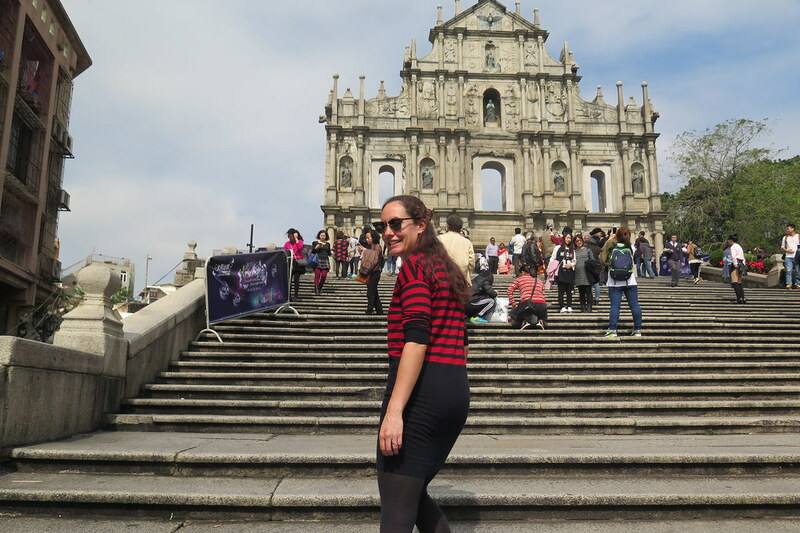 Leaving Hong Kong, we’d decided to go via Macau and into China via Zhuhai, instead of going back into Shenzhen. This will save us the distance north to cross the Pearl River before we can head west. But it meant we had to take the ferry across the estuary to Macau. First, we caught the MTR downtown from Tin Shui Wai. As with when we arrived, we had to take our front wheels off when we entered the station. The staff were pretty hot on this and made sure that we continued to the train without putting the wheels back on. Going up the lift, a guy noticed us struggling and offered to help us on to the train. We had waited till after 10 o’clock to get the train as we thought it’d be less busy outside of rush hour, but the carriage was crowded and I’m sure we pissed a few people off with our bikes blocking the doorway. Our friend’s name was Daniel, and he really helped us out with carrying our front panniers while we manoeuvred our bikes. I’m not sure where he was going to, but he continued with us to Austin Station and helped us get off the train and get into the lift from the platform. 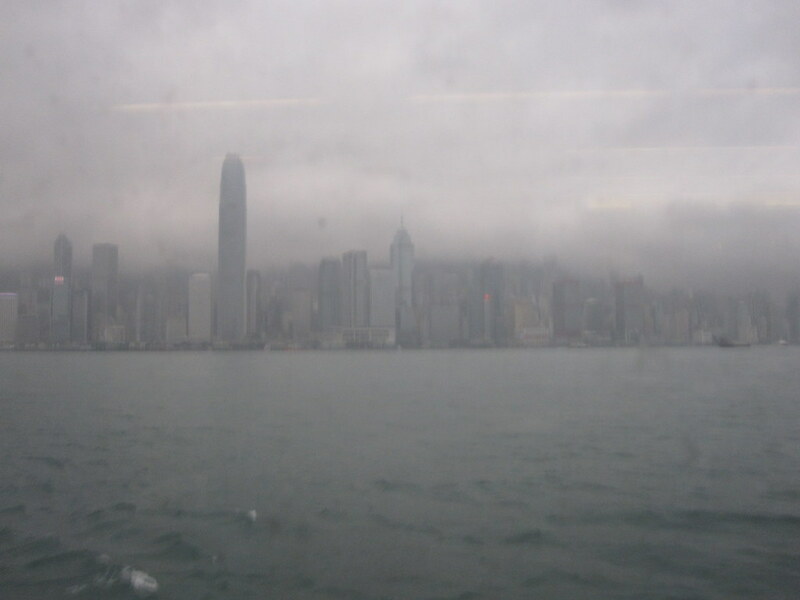 One last goodbye to Hong Kong harbour as it disappeared into the rainy mist behind us, and an hour or so later, we were docking in Macau. 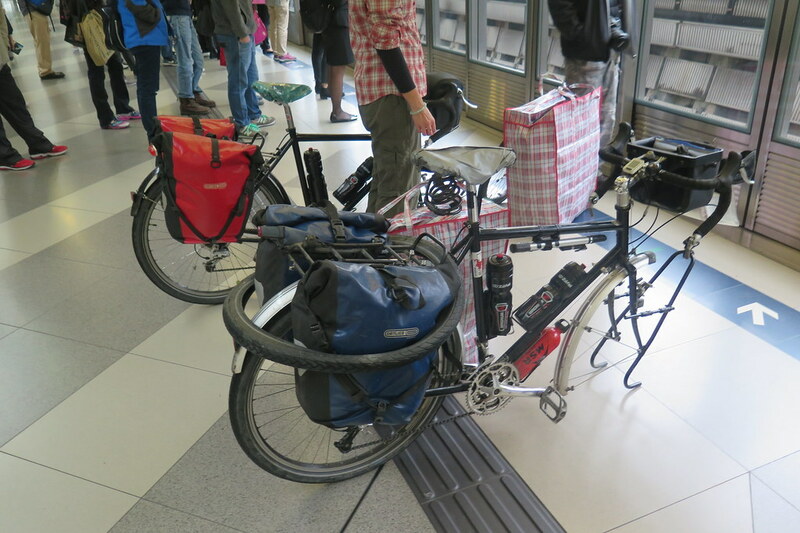 We reattached the wheels and wheeled our bikes off the boat, with no objection from the staff in the Macau terminal. We got through the passport check quickly and rolled out into the rain to find our hotel, strategically booked for its proximity to the ferry port. We were in our room and drying out within 15 minutes, glad to have arrived. It was probably the toughest 7km day we’ve ever had! 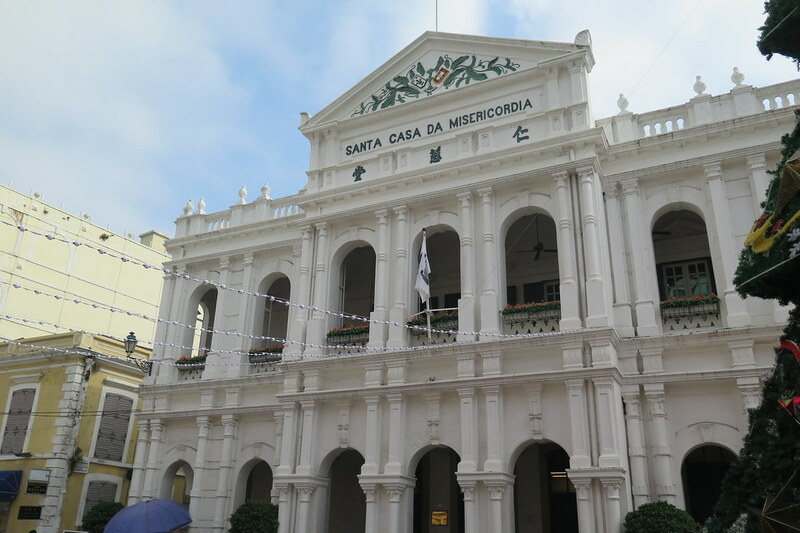 Macau is a mad mix of in your face wealth, colonial history, narrow streets and good food. We had a full day there and just wandered around the old town area seeing the sights. The casinos are the big attraction, with the Chinese making up most of the clientele. 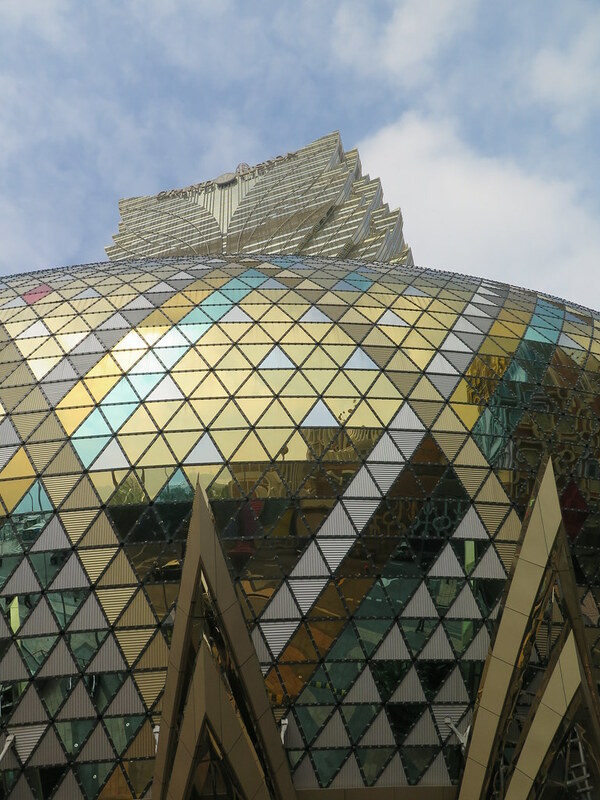 The gambling industry is 7 times bigger than that of Las Vegas which is mind blowing considering how small Macau is. Needless to say, we weren’t lured in to any of the high stakes tables but it was cool walking around the area in the evening, surrounded by neon and luxury cars. 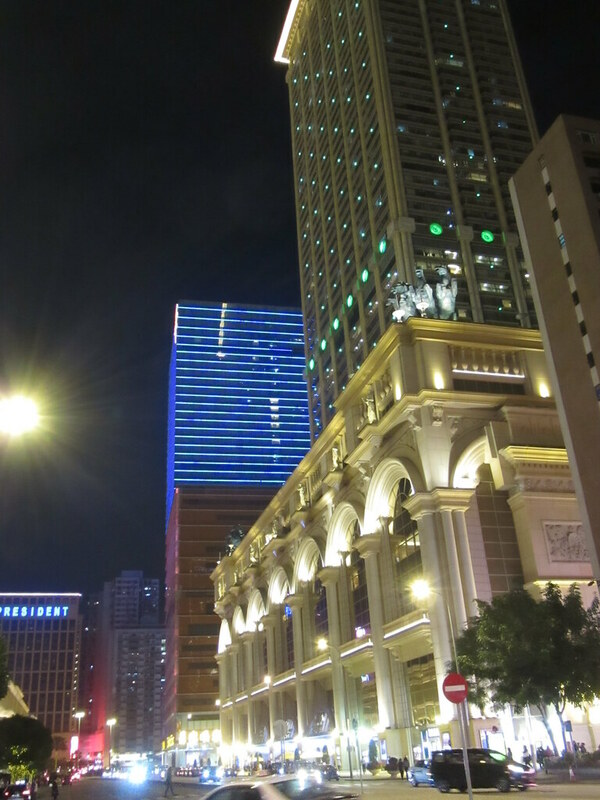 We had a two nights in Macau before we crossed back into Zhuhai, in China. We’d been in touch with a Warmshowers host in Zhuhai who advised us against taking the main land border crossing as it’s always busy and it usually take a couple of hours to get through. 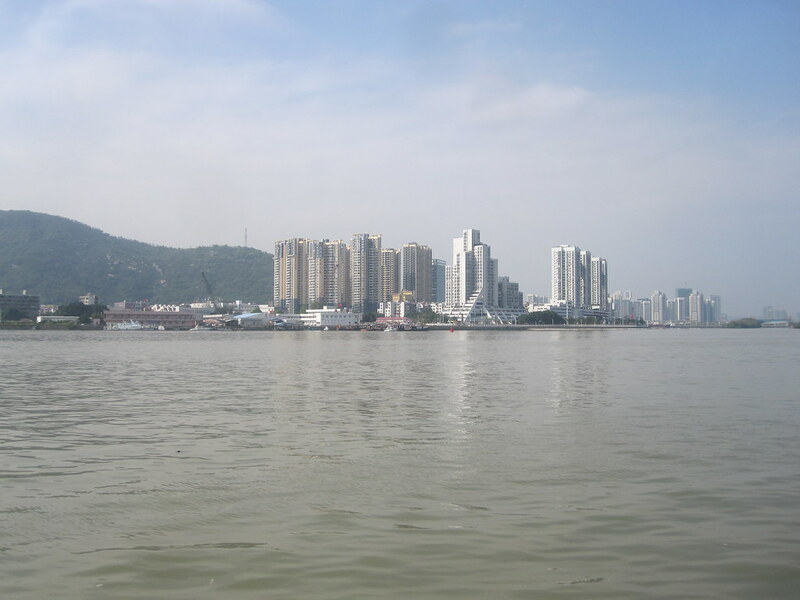 Instead he recommended taking a ferry across the river from Macau’s west side over to Wanzai port in Zhuhai. It turned out to be really easy. 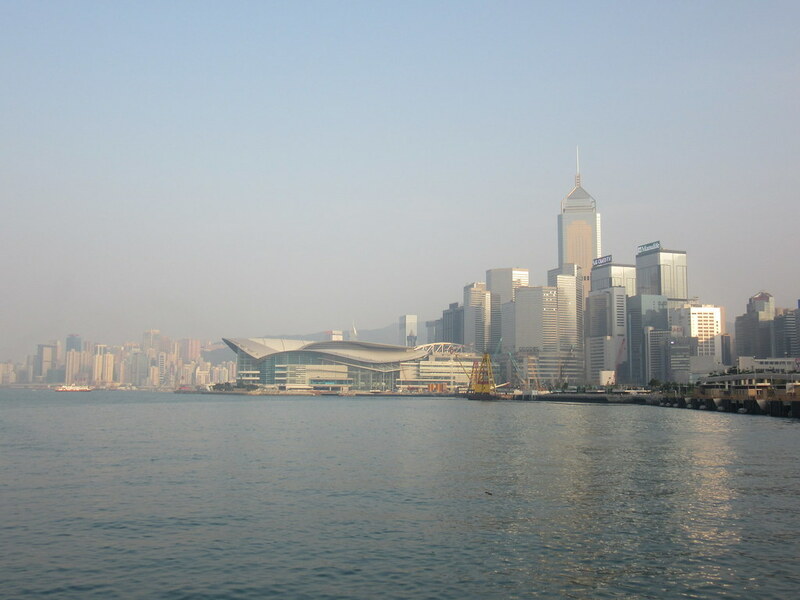 The ferry was only $30 HK and took just a few minutes. It wasn’t busy either, so passport checks on both sides were quick. But most importantly, we didn’t have to take the wheels off the bikes. Once we were back on the China side, things actually felt quite familiar. The noise, the unruly traffic and the stares weren’t anywhere near as strange or intimidating as the first time around. We were straight back onto the road to ride the short distance to our Warmshowers host, Justin’s place. We arrived mid afternoon, when we knew he’d be at work, but his wife, Cara, kindly welcomed us in, even though she said she’d been feeling unwell. Once we unloaded our bikes, we checked in to wifi for the first time since leaving the hotel that morning and received an email from Justin. 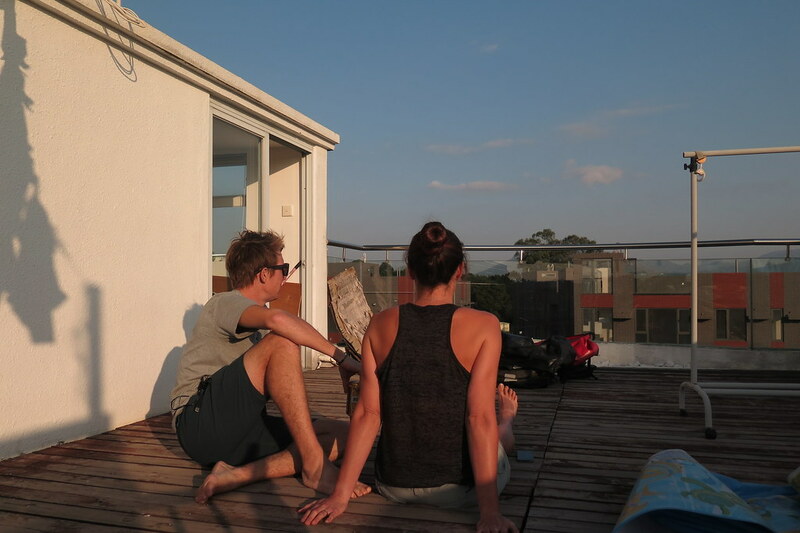 He apologised and said Cara was sick, so could we find somewhere else to stay. Awkward. Anyway, we packed up our stuff, apologised for the breakdown in communications and headed off. Nothing worse than feeling sick when you’ve got guests, so we definitely didn’t want to impose. Luckily, we were back in China, so we didn’t have to travel too far before we found a cheap hotel for the evening. We’re not fully sure of the route from here, but our next destination is Vietnam. Our visas don’t start until the end of the month so we’ll take a leisurely route heading west through Guangdong and Guangxi provinces. 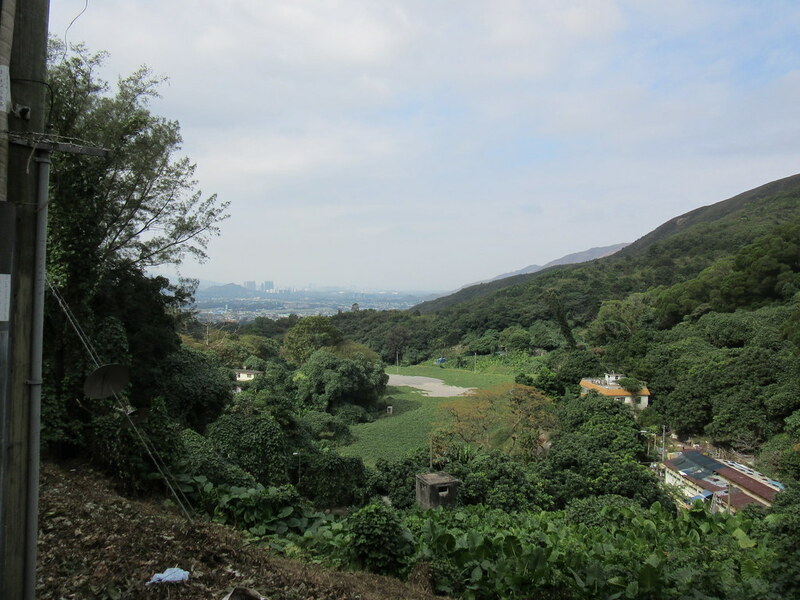 The first part will be through the Pearl River Delta which is quite built up and industrial. Apparently there are some nice beaches further along the coast, so although it’s not exactly swimming weather, it’ll be nice to be riding near the sea again.